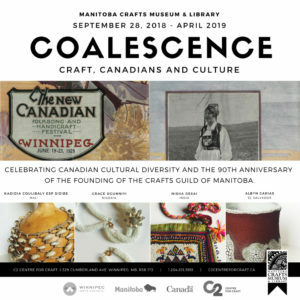 Celebrate Canadian cultural diversity and the 90th Anniversary of the founding of the Crafts Guild of Manitoba through a new exhibit curated by the Manitoba Crafts Museum and Library. In 1928, a New Canadian Folksong and Handicrafts Festival, organized by the Guild and the Canadian Pacific Railway, sought to provide a venue for new and established Canadians to get acquainted. The festival included 13 different nations, with their art, music, culture on display. Our exhibit pays homage to this original festival and also showcases craft from Canadian newcomers.